Many homes come with kitchens that are less than ideal. The lighting can be terrible, the appliances old, the floors grimy … and counter space? Well, that’s a nice idea. Get the most out of the kitchen space you do have with these tips. You can create extra space, even when it seems impossible. Over-the-sink covers, cutting boards and colanders help increase your workspace. Burner covers for your stove and a large cutting board or tray can create extra counter space when you’re entertaining and want to set out snacks (provided you don’t need to use your stove). Fold-up tables (attached to the wall or stand-alone) offer extra space when needed. If there’s room, a butcher block or island instantly create food prep or storage space. Another simple way to create space? Pare down your belongings — especially on the counters — and only keep the necessities. A wall above the stove may be perfectly suited for a pegboard where you can hang pots, pans and utensils. Magnetic knife and spice racks can fit into small wall spaces under cabinets or above sinks. Refrigerators can serve as storage space for magnetic spice racks, towels, pot holders, or dry-erase boards or chalkboards, which are both useful and decorative. And over-the-cabinet hooks and towel racks add extra storage quickly and easily. 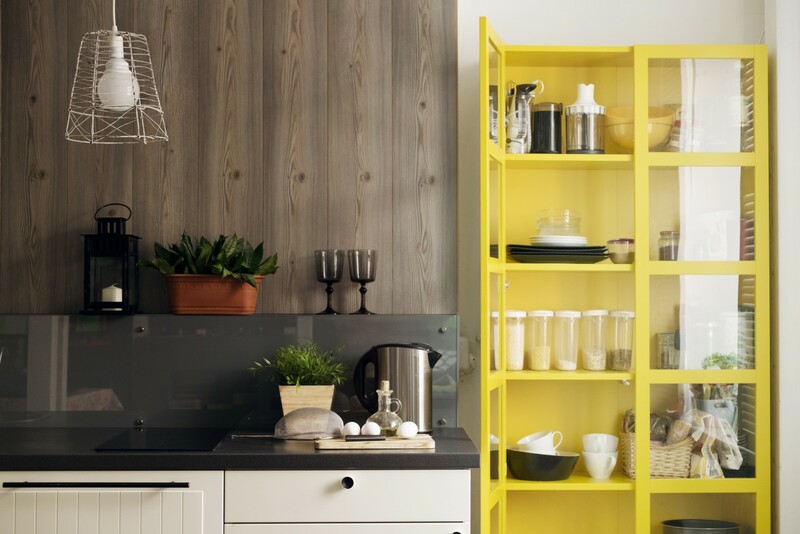 Small bookcases are a kitchen’s best friend. They are perfectly narrow, they come in many heights and they offer tons of storage options. In addition to keeping cookbooks tidy, they can also hold pots, pans, dishes, food items, storage containers and baskets. Add hooks to the side of your bookshelf to store aprons or other lightweight tools. Art and color are fast ways to personalize a small kitchen. Color-coordinated kitchen accessories become art in and of themselves, and a simple color palette lets the eye rest in a small space. When using every inch of space, don’t forget to leave room for a few decorative elements. Hang attractive tea towels with pushpins for a practical splash of color. And fresh flowers on a shelf or table instantly brighten the space and add life. If you have a windowsill, an herb garden is the perfect way to use the space and bring vibrancy. You might even consider installing a vertical garden. Every older kitchen has at least one eyesore: an ancient microwave, a scratched-up refrigerator or a hideous vinyl floor. If you’re not ready to put down the cash for a remodel, cover these as best you can. Cover exposed sink pipes with curtains attached to the bottom of the sink (bonus: extra storage space). Store your old microwave or replace it with a newer, more attractive version. As for scratched or just plain ugly refrigerators and appliances, adhesive vinyl can create a like-new look in a matter of minutes. Cover unsightly floors with kitchen-friendly mats that also make standing at the counter easier on your feet, and refresh old cupboards and drawers with plain or patterned drawer liners. Lighting in any kitchen is hard to get right. Many fixtures make the space feel dated, and upgrading bulbs and cleaning light covers will make a difference right away. Consider installing adhesive under-cabinet lighting to better illuminate your workspace. If you can direct your lighting, such as track lighting, make sure it points to the kitchen triangle — that well-worn path from the stove to the sink to the refrigerator. If overhead lighting is scarce, consider using table lamps and even floor lamps. A floor lamp in a kitchen might seem odd at first, but put it at the end of a counter or tucked behind a table, and you’ll be grateful for the extra light. Originally published June 6, 2016.